We deny an existing monaural cartridge so far. The existing structure is because I cannot play a monaural LP faithfully. And we made a cartridge for exclusive use of the monaural LP with a vertical axis concentration method. The cartridge of the vertical axis concentration method plays a monaural LP faithfully. The monaural cartridge developed in the monaural music times is made to play only a monaural LP. The cartridge of the monaural music times does not work lengthwise, and it is made with the structure that can trace the amplitude by the movement of the cross direction precisely. I evolved a monaural cartridge of the time more, and a cartridge for exclusive use of new monaural recording was born. Why is a monaural cartridge necessary in the present age? There are a lot of monaural LPs to excellent records such as classical music, jazz, a lock. When I look for the LP of the excellent performance, monaural recording knows a thing more than the half. And I want to come to listen to a monaural LP by a good sound. There are people purchasing a monaural cartridge easily. And there are people playing a monaural LP with an existing monaural cartridge and stereo cartridge. The people feel a monaural LP like an old sound by the influence of the cartridge. And an image is left as an old LP. In fact, the monaural LP has better sound than the stereo LP. It is natural that a sound is better than the stereo LP to put two signals in as for the monaural LP which installs one signal in one ditch. We pursue that we hear a splendid performance from an LP. It is the most important for a hobby called the audio system. I produced "Kotetu" to lower a price. However, Kotetu thinks sound quality to be important. The structure is the same as Spirit and Premium. The user can listen to a monaural LP by real sound quality. The stylus of Kotetu MONO was changed from conical to elliptic on October 2, 2017. The trace ability slightly improved by elliptic. 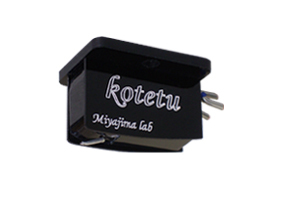 Product name Monaural Cartridge "Kotetu MONO"
"Spirit" is a representative cartridge of the vertical axis concentration method. It is steady deep clear sound quality. And the delicate, speedy sound can express the feelings of the musician. The stylus of Spirit MONO was changed from conical to elliptic on October 2, 2017. 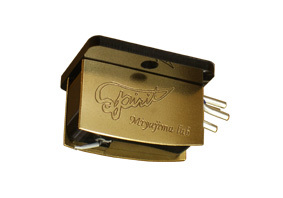 Product name Monaural Cartridge "Spirit MONO"
Monaural Cartridge "Spirit MONO high"
Production of PremiumBEII has ended. 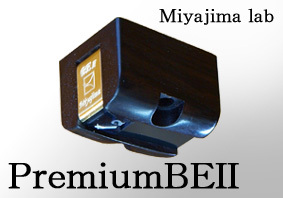 Product name Monaural Cartridge "PremiumBEII MONO"
0.7mil is suitable for reissue monaural LP and a monaural LP of after 1960. 1.0mil is suitable for the monaural LP of a deep groove of the first press of the 1950s. However, both styli can trace the monaural LP of all generations without a problem. When you listen to the monaural LP of all generations, we recommend 0.7mil. When you listen to a monaural LP of the first press of the 1950s mainly, we recommend 1.0mil. "Zero" is the best product in a monaural cartridge. Zero improved sound quality more by the axis of the non-magnetic body. Please enjoy clearer sound quality. The output of Zero is 0.4mV. 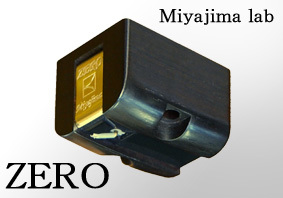 Product name Monaural Cartridge "Zero MONO"
"INFINITY MONO" made heavier than ordinary cartridges to pursue ideal. It is a size outside common sense. The size of the body is W 24.0 mm x D 28.6 mm. The length of the terminal is 4.0 mm. Please check whether it can be used for the tone arm or head shell you have. That sound expresses unprecedented low tone volume, clear, three-dimensional, and instrumental quality. It is music, not audio. This cartridge is special. The wiring of the terminal of this monaural cartridge is the same as ordinary stereo cartridge. 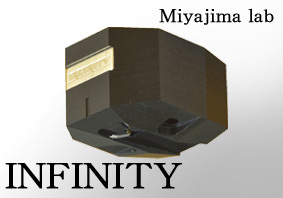 Product name Monaural Cartridge "INFINITY MONO"
The monaural cartridge of the vertical axis concentration method is a patent of the Miya-jima laboratory. By the method, the wide blurring of the coil decreased, and the needle was easy to work aside and did not move at all lengthwise. Therefore the generation by a highly precise turn became ideal and was able to change the amplitude of the groove of the monaural LP into a sound precisely. The vertical axis concentration method expresses space of the best monaural music. The cartridge of the vertical axis concentration method plays only a monaural LP. It cannot play a stereo LP with this cartridge. When it played a stereo LP with this cartridge, a sound is that a distortion and a needle do not work lengthwise, and there is the thing that a needle injures the ditch of the LP. As for blue note LP of the 1,500th level and the 4,000th level, the sound of the cello of Casals and Beatles LP of the product made in U.K., the splendid performance in those days is recorded. And its music revives wonderfully when this cartridge plays a monaural LP. Copyright © Miyajima Laboratory All Rights Reserved.